This nice comparison with a remote control made me think about how I use mine. The device that controls my TV (and VCR) has a little flip hiding the “advanced” buttons. 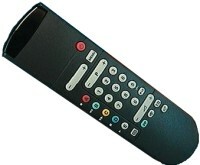 I do not have a photo of my remote control, but I found one that is reasonably similar. The top part until the red power button can be opened to reveal more buttons. The basic buttons such as channel selection, volume and start/stop for the VCR are always visible. If you lift the flip, you get extra buttons for selecting input sources (e.g., DVD player or camera) or outputs, changing the parameters of the display and other exotic stuff. As it turns out, two of the “advanced” buttons on my remote control are as worn out as the channel and volume selection buttons that are among the “normal” buttons. So I am very glad that these buttons exist, otherwise the device would have been far less useful to me. On the other hand, I understand that they are hidden under a flip because some other people (whether they are a majority or a minority is irrelevant) would probably never use them. Even myself, I do not need to see all buttons all the time. The comparison with this little device that I use almost every day is very interesting to me. And I take some lessons from it: the designers of this device could not predict which buttons I would use most frequently. They modeled this device for a slightly different class of users, yet I enjoy using it because the “advanced” buttons that I need are still within reach when I need them. In case you cannot guess where I’m heading yet, let me add that the “advanced” buttons are not visible by default so that they do not confuse those who do not need them, but they are easily discoverable and once you get to them, they look and behave exactly like the other buttons. I do not need to open my TV and flip a few DIP switches to get to the advanced options. Translated in the GNOME or GIMP world, this means that I would have a default set of features that I can play with but also some advanced settings that are easily accessible from the application without having to resort to some other obscure tool such as a gconf editor. I do not really need to have “everything at my fingertips” and be confused by huge configuration dialogs for every little feature. In fact, I prefer to have the less frequently used options hidden away, as long as there is an easy way to access them whenever I need them. It is essential for these advanced options and features to be discoverable, so the dialog that contains the basic options should give a visible hint that more stuff exists but is hidden (using an expander for the dialog or an “advanced options” button or whatever). Also, even if I do not use some of the other “advanced” buttons on the remote control, I do not think that I would have bought that TV set if I had not seen that these options were available. Update: moved the image and its description up a bit. It has been a long time since I last updated the metadata code in GIMP CVS. It is annoying how real life gets in the way… In fact, my contributions to the GIMP have been almost nonexistant in the last months, except for some minor contributions to the help pages. But I will take advantage of the Christmas break to get back to that metadata code. First I have to fix some outstanding issues with the model (based on XMP) so that it is easier to link the model and the GUI. Currently, opening the File->Properties window leads to an ugly collection of empty widgets. Once the model and the GUI are correctly linked, it should be possible to have correct values displayed in these widgets and to update the model when the values are edited by the user. Once this first step is done, it should be much easier to work on the remaining parts: adding pretty widgets in the properties window, converting to and from EXIF and IPTC, and eventually moving some of the code currently residing in gimp/plug-ins/metadata/ into a library so that plug-ins could link this code directly instead of using some functions through the PDB. I will write more about this once the first step is done. Two days ago, I enjoyed reading the collection of tricks titled How To Write Unmaintainable Code and I mentioned it to a colleague. We both had fun reading it and commenting on some entries, but then forgot about it. Nothing unusual, right? Just commenting out a few lines that are not ready yet. Well, this is wrong! I found out that the problem was precisely there: the unexpected results that he got were just the contents of the exit page. The problem did not come from some other part of the code that we were looking at. It came from the lines that were commented out. Why? Well, it should have been obvious: the scope of the JSP tags <...> and <jsp:.../> is evaluated before the language-specific features such as comments, etc. As a result, the <jsp:forward.../> was not commented out. On the contrary, it was now unconditionally included, since the if condition had been removed. That was a nasty trick! The bug was fixed quickly, but we thought again about one of the interesting examples in “How To Write Unmaintainable Code”, specifically the one titled “Code That Masquerades As Comments and Vice Versa”. Rather dense in Europe, but unfortunately not much outside of it. I am planning to change that. North America is shown as one big piece, but to tell the thruth, my visits to Canada have been limited to Quebec (plus one airport stop that doesn’t count) and my visits to the US include only CA, AZ, NV and UT (plus DC and IL if you include airports). Note that the isolated red dots (islands) around Hawaii are incorrect and came as a side effect of selecting the US, but most of the other ones are correct. Once I managed to get the necessary information for configuring my Speedtouch 350 DSL modem (see part 1), the next logical thing to do was to start using it. Or at least try to. The first problem was that Belgacom apparently never sent me the letter containing the user name and password that I was supposed to use for accessing their services. After spending a few minutes on the phone (that music sounds familiar) I got a login and password that I could use. Well, that’s what I thought. I learned later that what I got was not the login/password pair that I asked for, but just a pair of passwords (for PPPoE and for POP). No login. Doh! My second call to the support center (ah, that music again!) was barely more successful: this time I got a user name and a (new) password, but again I discovered later that the user name that I got was incomplete (last characters missing). The third call was more interesting. After 20 minutes of music (I really know it by now), a technician told me about the missing characters in my user name and asked me to try logging in while he was monitoring their side of the DSL line. This time, the PPP authentication was successful but then the PPP connection went down immediately after that. Strange! The modem re-tried a few seconds later, with the same results. And again, and again… After a few more minutes of debugging, he told me that he was resetting their card and asked me to power-cycle my modem. I did that and when the line came back, the connection worked and I was able to access the Internet. Oh joy! But I also noticed something else while looking at the system log of the modem: the connection speed after the reset had dropped from 3 Mbps to 1 Mbps. I mentioned that to the guy, who said that it was normal. Ah well, at least the ADSL connection was usable so I was happy (after wasting two hours on that). According to a colleague who had a similar experience, the reason why my line went down immediately after a successful authentication was related to the 3 Mbps. By default, the DSL access is configured for 384K/3M up/down. But the offer that I had accepted had a cap at 1 Mbps (apparently, because I never got the letter with the details of the offer). Although the telco part of Belgacom handling the DSL access was happy to let me in with 3 Mbps, the ISP part of the company was not happy with that and dropped the connection immediately. That could make sense, but I am still wondering why the access line had not been configured correctly on their side in the first place and why it took so long for the problem to be identified. Ah well, at least I can use my connection now… And I am glad that I could do all the tests using the built-in web interface of the modem over Ethernet instead of USB. I’m wondering what would have happened if they had required me to use some Windows software for configuring the stuff. he asked me what version of Windows I was running and I said “Linux”. modem would be delivered soon. So far so good. empty filesystem. From a Windows system, everything looks fine. access the configuration menu of the modem. More than two years ago, I reported an issue to the XHTML working group: the specifications for all versions of HTML and XHTML (up to the XHTML2 draft that was current at that time) forbid the usage of the <noscript> element in <head>. As a result, it is difficult for a page author to have a fallback solution in case scripting is disabled and the header of the page contains a script generating a link to a style sheet or generating the title of the page. Well, in reality it is possible because all browsers support the usage of <noscript> in <head>, but this is not allowed according to the HTML and XHTML specifications. The main issue is that due to the way the DTDs for the various versions of HTML and XHTML were defined, the <noscript> element could only contain elements allowed inside <body>, but not the elements allowed inside <head> (such as <link>, <title>, <meta> and <script>). So <noscript> was simply not allowed in <head>. I was pleasantly surprised when I received an e-mail message yesterday telling me that this issue had been addressed some time ago in the XHTML2 draft but they forgot to notify me earlier. The way this issue was solved (together with other related issues) is interesting: they introduced a new Handler module to XHTML2, defining a <handler> element that basically replaces the old <script> and <noscript>.